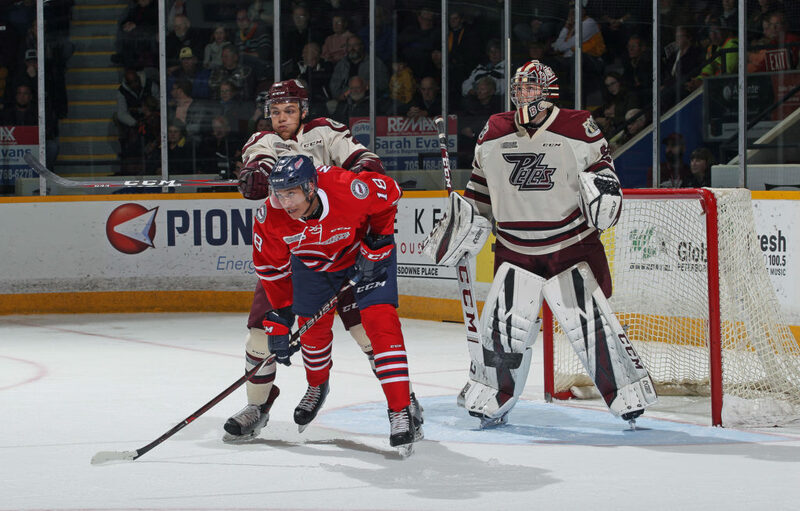 Seven would prove to be an unlucky number for the Petes on Friday night, as it was the number of goals scored by their rival Oshawa Generals in the opening game of the Eastern Conference Quarter-Final while Peterborough struggled to find offense. As they’d done six times during the regular season, the Generals opened scoring on the maroon and white. Allan McShane took a centering pass out of the corner from Serron Noel before dishing to Anthony Salinitri. Salinitri sent the puck over Hunter Jones’ blocker 2:10 into the game. The rivals exchanged minor penalties a few minutes apart before Swiss import Nando Eggenberger doubled Oshawa’s lead. Ty Tullio dug the puck off the boards, moving it to Lleyton Moore in the high slot. Eggenberger was the only one that had eyes on Moore’s rebound and put it past Jones with 1:38 remaining in the period. Balanced first period play saw the Petes put up 15 shots to Oshawa’s 13. The crew in cream jerseys were dominant in the face-off dot, but the Generals were up 2-0 where it counted most through 20 minutes. Another early period possession by Oshawa resulted in a tally by former Otter and Frontenac Brett Neumann. The play started with a stretch pass from Danil Antropov to Brandon Saigeon on the opposite side of the ice. Saigeon collected his own rebound behind the goal line then passed the puck in front to Neumann. Neumann and Antropov played a give-and-go, with Neumann scoring Oshawa’s third of the night 1:37 into the second. Peterborough successfully killed off their second infraction of the night before the Generals made an obvious habit of scoring early and late, with their fourth marker of the game coming 1:36 left in the middle stanza. A Petes clearing attempt was negated by Moore at the top of the zone before he passed it parallel along the blue line to Mitchell Brewer, with Brewer’s point shot redirected by Saigeon past Jones. The Liftlock Lads continued to lead in face-off wins, but now trailed on the shot clock after being out-shot 15-8 in the second period. The Petes were afforded their second man advantage of the match mid-way through the frame, and though they managed a handful of shots on Gens net minder Kyle Keyser, they couldn’t convert the opportunity into a goal. Oshawa added to the damage at 11:24, further extending their lead to 5-0 thanks to Kyle MacLean. The puck was kept in at the blue line and worked off the side wall by Eggenberger. He connected with Tullio to feed MacLean who forehand to backhand and back again to beat Jones. Generals fans started counting their club’s goals on two hands in the second half of the third, on the game’s only power play marker at 13:40. A pass from Saigeon from behind the goal line appeared to be headed to the far circle, but was instead picked up by Neumann and planted into the net. MacLean earned the second assist on the play. The final goal from the Generals, courtesy of Ian Blacker, sealed their 7-0 victory. Oshawa broke out from behind their own net and played the puck into Peterborough’s zone as Cole Resnick chased it toward Jones. In an attempt to play the puck, Jones fumbled and Blacker pounced on it, with Kyle Bollers collecting the secondary assist. A late Petes power play saw one more shot on Keyser, but the American World Junior goalie would secure his 33-save shutout. Final shots were 47-33 in favour of the Generals. The Petes are back in Oshawa for game two of the series on Sunday, March 24 at 6:05pm. The Eastern Conference Quarter-Final then moves to the Peterborough Memorial Centre for games three and four on Tuesday, March 26 and Thursday, March 28, with both games taking place at 7:05pm.